Just £2450 will get you behind the wheel of one of the most interesting small sports cars of the past 15 years – a Smart Roadster Light coupé. The 2005-registered £2450 car we found has done almost 90,000 miles. It has only seven service stamps in the book – not ideal given the tiny engine’s fondness for fresh oil (every 7000 miles). However, assuming it’s sound, it’s worth a blast up the road if only to sample a Light’s sweet ride, courtesy of its tall, skinny 185/15 tyres, compared with the meatier 225s fitted to standard Roadsters. 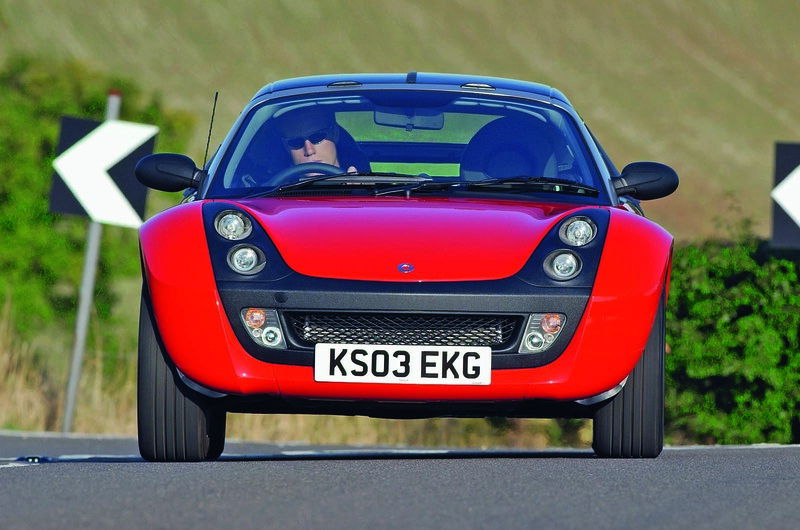 The Light, so-called because Smart stripped out some features, including alloy wheels, from the standard car to create it, retailed at just shy of £12,000 when launched in 2004, around £1500 less than the standard car. Even so, it weighed the same 790kg. It was launched in response to criticism of the standard version’s perceived high price. That car had been launched in the UK in 2003 and was available in convertible and coupé forms. Like the Light, it had a rear-mounted 698cc three-cylinder turbo engine developing 80bhp. 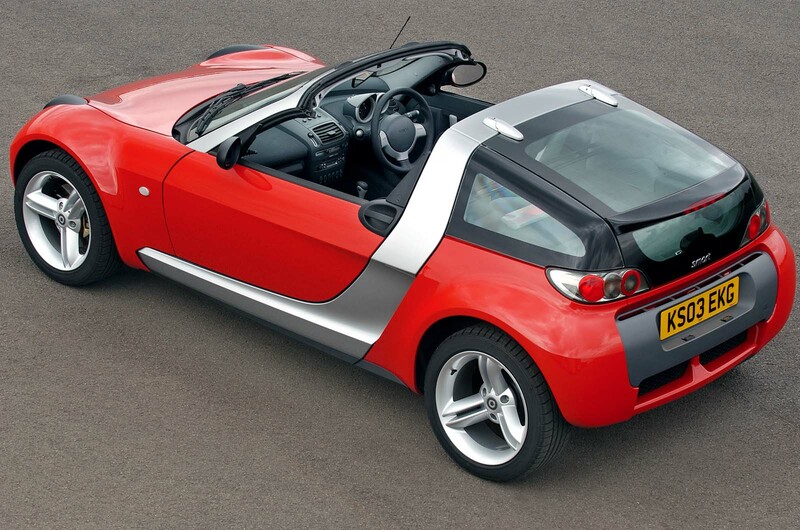 This wasn’t quite the same engine fitted to earlier left-hand-drive Roadster convertibles that, a few months before, Smart had sent to the UK in response to the first grey imports. The Smart Fortwo-derived engine in this car produced 60bhp and lacked the more powerful engine’s oil cooler and strengthened internals. In 2004, the same year the Light landed, a tweaked Brabus version arrived offering 101bhp. Envious owners of standard cars could buy an official 10bhp upgrade called the Brabus SB2, taking their car to 90bhp. It cost £1000 so is rare, although it was offered free on the special-edition Bluewave and RCR models. 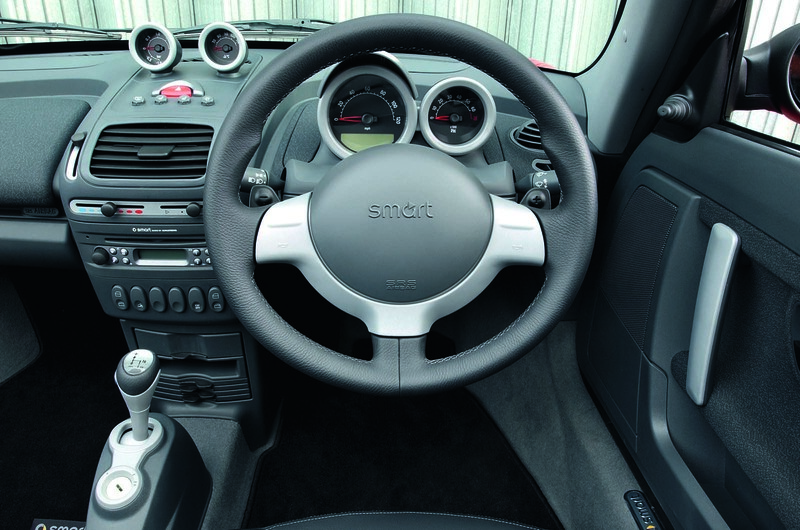 Today, specialists such as Fudge Smart can remap the standard 80bhp engine to 115bhp for £199. It provides extra urge but, at heart, the Roadster is more about enjoying corners than haring down straights. Being a Smart, the Roadster is a distinctive-looking thing clothed in plastic panels and with a galvanised Tridion safety cell. It has MacPherson struts at the front, a de Dion rear axle and a six-speed semi- automatic gearbox with optional paddle shifters. Brakes are discs at the front and drums at the rear. The convertible had an electrically powered hood (check the fabric roof hasn’t shrunk) and the coupé a couple of removable roof panels (which rattle as standard). The coupé is slightly more practical, the convertible prettier with the roof down. Both are far from watertight. Standard spec includes electric windows and switchable ESP. Additional options encompassed a turbo boost gauge, leather seats and air-con. Most parts are available from Mercedes dealers and worth the extra because they last and fit first time. 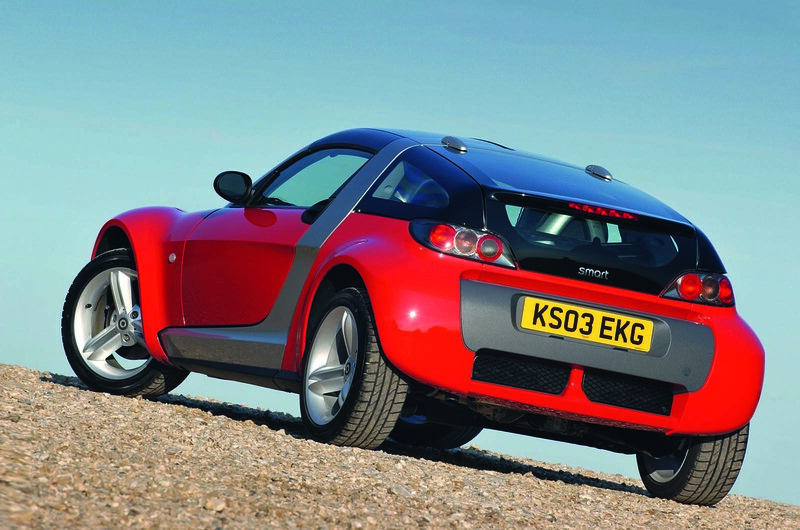 With prices starting from as little as £1000, buying a good Smart Roadster could be the smartest thing you do this summer. ENGINE – Oil changes should be 7000 miles. The B service requires replacement to fall six spark plugs but often only three plugs are changed. Bore wear is not unknown. Sundry misfires could be the coil packs, perished HT insulators or a holed exhaustvalve. TURBO – Check for smoke, suggesting turbine shaft oil seals or bearings have failed. Take the car to 70mph and floor it in top gear, feeling for the turbo pulsing – a sign that the turbo is failing or the manifold is cracked. STEERING, BRAKES AND SUSPENSION – Check the rear drum brakes have been serviced. (Seized adjusters are common.) Listen for clunks when turning. Ensure all four tyres match. BODY – Grey powder-coated Tridion cell resists corrosion but black-painted ones are starting to show early signs, despite being galvanised. Check the lacquer condition on the plastic body panels. LEAKS – On both models, water can enter via the rear left-hand corner of the roof, the top of the A-pillar where three seals meet, the windscreen scuttle and, most serious, the bulkhead, where it runs down the wiring loom into the body control module (called the signal acquisition module or SAM). INTERIOR – Check the dashboard LEDs illuminate and the air-con works. (The compressor hoses perish easily.) Ensure the power hood works and the official tyre repair kit is present. Ignore registration year in favour of mechanical condition. The Roadster was produced between 2003 and the end of 2005, yet it’s possible to find examples registered as late as 2007. Some of these were built in 2003. £500-£1495 – A range of part-runners requiring various degrees of surgery. £1500-£2450 – Dealer-sale coupes around 80k miles, with short warranties but good histories and in decent condition. £3000-£3495 – More of the same, including a ‘one lady owner’ 2005/05 coupé with 40k miles and full service history for £3495. £3500-£3995 – More convertibles and Brabus models starting to appear, plus tidy low- mileage models of all types. £4000-£5500 – Run-out Finale and last Brabus models. SMART ROADSTER COUPÉ FINALE, 2006/56, 72K MILES, £2700 – This private-sale car has full Smart specialist service history and has had three owners. Current one has owned it for eight years. Car is always garaged and has just had new tyres and pads, although the air-con pipes are broken.